Over/Under: Over 178.0 at 1.90 Bet Now! This clash between two Spanish sides is likely to be an exciting game in Round 3 of the Euroleague campaign. The hosts are one of four undefeated teams at the start of the season while Vitoria head to Madrid with a 1-1 record. They are obviously regular opponents in domestic basketball but they have only played twice in the Euroleague, in last season’s Top 16. 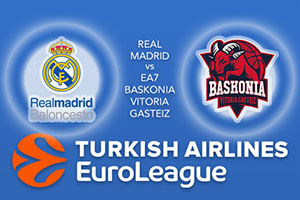 Madrid won’t want to be reminded of the previous Euroleague clashes between these teams and the hosts will know they have enough to take this game. They can call on Sergio Llull, who has started the season in fantastic form. Llull has provided an average of 18 points per game in Madrid’s opening two games. Other players who have assisted the Spanish giants are Jaycee Carroll with an average of 14 points per game and Rudy Fernandez, who has served up an average of 12 points per game. Carroll has been on fire with three-point shots so far this season and this could be an area where Madrid look to win the game. The host’s defence has also been a lot tighter than their opponents so far this season. Vitoria will look back on the two Euroleague Top 16 triumphs last season as all the inspiration they need to win in Madrid. They won both of them with the second game being an 88-89 thriller, and that is exactly the sort of game that people want to see tonight. Another result like that and Baskonia will be delighted but they are missing a key player. Andrea Bargnani has averaged 21.5 points per game this season, making him joint top-scorer in the season, but injury sees him missing out in Madrid. Tornike Shengelia has an average of 14.5 points this season and Adam Hanga has notched an average of 12 so far for the away team. These two will need to deliver in the absence of Bargnani. Madrid should win, and with a bit to spare but take Baskonia Vitoria Gasteiz at +11.5, which you can find on offer at odds of 1.90. If you’re looking for the Over/Under market, look to go OVER 178.0 on offer at odds of 1.90. Bet Now!